Bottombracket: Pinning on numbers once more. Pinning on numbers once more. 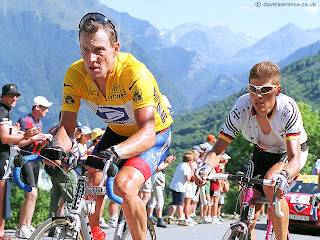 L. vs J., c. 2001, with both running downtube shifters to save the grams. The sun shone without heat, the wind was calm by the lake and being some kind of glutton for punishment, I went out and spent $45 to race for less than an hour last Sunday, in criterium race a five minute ride away from my place. But I had my reasons. The course was actually our lakeside bike path, meaning it was damned narrow, ie, three metres across if that, and featured not one but two hairpin turns. Naturally the second turned onto the final straightaway and meant that good position was crucial in the final lap, as there was no breakaway group to be in. And so it went that I found myself a good thirteen or more wheels back going into that turn, and sprinted to an uninteresting 11th place out of twenty-five. It was a thoroughly unsatifying conclusion to $45 worth of nervously sitting in the wheels, trying not to get run off the path into a tree by some over-zealous junior. Alley cat races are vastly more fun, creative, and dynamic. They seem to win on every front: cheaper to enter (ie $10), you get to see people you know and like, all sorts of creative curveballs can be thrown in (ie, store checkpoint where you have to buy a can of beans, or park where a particular plaque on a statue must be found), and the sponsors' prizes are vastly cooler as well. There is also this complete lack of equipment sport snobbery and attitude that road racing is notorious for, and which I continue to find nauseating. So why do I even think about sanctioned races, all of which are hill-less around here and meant only for sprinters anyway? Just because. My Weekend of Hideousness & Ikea.